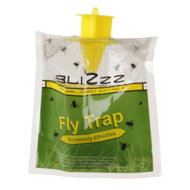 The BliZzz Megatrap will effortlessly catch MEGA-many flies. Look at the movie below for an impressive demonstration. Suitable for in the garden, in the yard, around animal quarters etc. Good for years of bug catch fun! The BliZzz Megatrap could fail to work after a few cold days. If this is the case, you should empty the Megatrap and top it up again with water and lure substance. Instead of lure substance you can also use a piece of meat (e.g. 200gr liver) as bait. Make sure that the meat stays submerged under water (e.g. 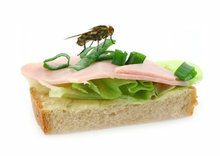 by putting a small stone on the meat) to prevent flies from nesting eggs in it. 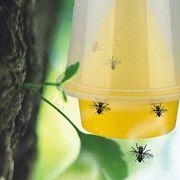 The lid of the Megatrap can also be used to make bigger fly catchers. 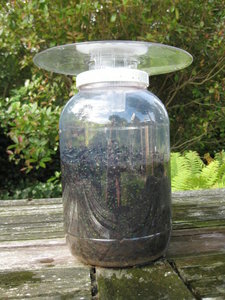 The lid can for example be put on a jerry can (see photos).